I was so excited to read about the goat progress, too. Wow, so much to think about, eh? I love the photodocumentary. It's as humorous as chickens themselves! GREAT pictures of the "escape." Don't ya just love their expressions and body language? 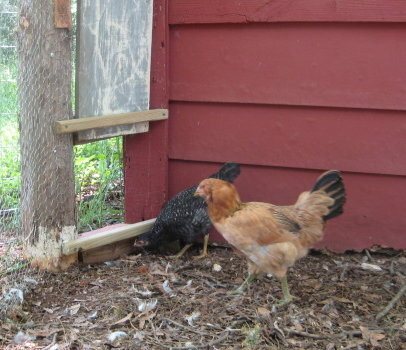 I'd say you have some very happy (if momentarily warily confused) chickens. It always feels so good to have accomplished one more improving step forward on the homestead, doesn't it? Those lucky birds! 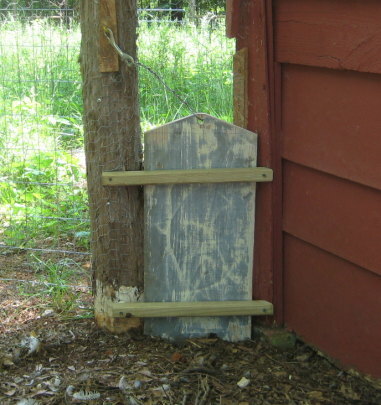 :) I like your guillotine door set-up. Are the posts for your run from trees on your property? 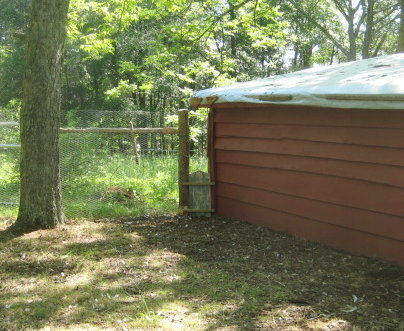 Yay for free range chickens! 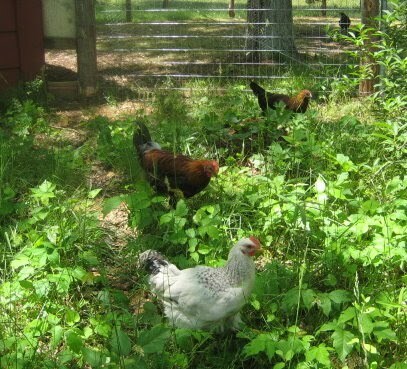 I try to let mine free range as much as possible, but we tend to have some predator problems in our area : (. so did you have to chicken sit or did they all behave and come home when it was time? Alison, it seemed like it would take forever, but now we're so close and I'm getting so excited! Katrien, they are a hoot. And it's funny how the story just presents itself when I download and look at photos to post. Mama Pea, thank you so much for visiting and taking the time to comment! 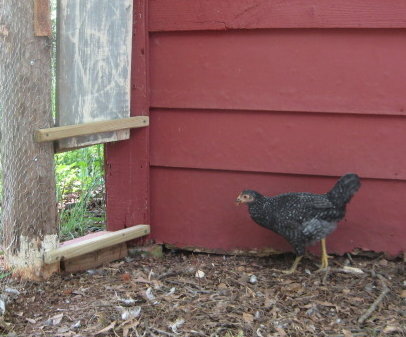 I never would have thought chickens could be so expressive, until we got some. And I agree, accomplishments like this and the goat fencing are a wonderful feeling. Maggie, yes, most of those are cedar posts cut on our place. We also bought a bunch for corner and brace posts for the field, as we don't have that many cedars. We realize that on our 5 acres, we really need to steward our trees. We're thankful for the ones we can use, and thankful for the ones we can let grow. Corine, yes those preditors are a problem. We're not sure if we're going to run in to that or not. 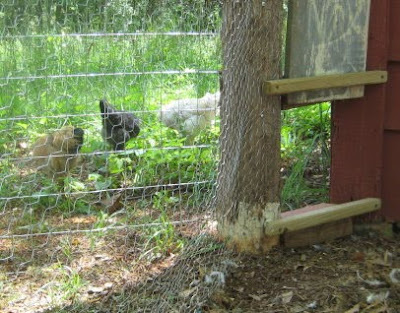 In fact, we're contemplating a LGD to live with the goats. 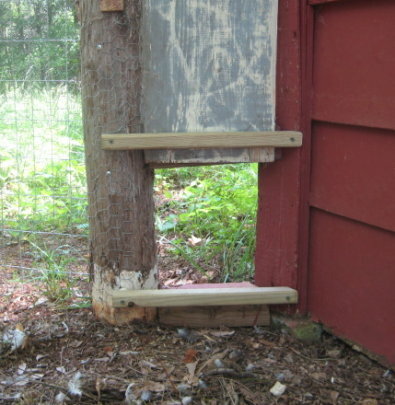 I understand these will guard chickens too! Renee, it's funny because I figured once they were allowed out, they would never want to come back in. But they do. 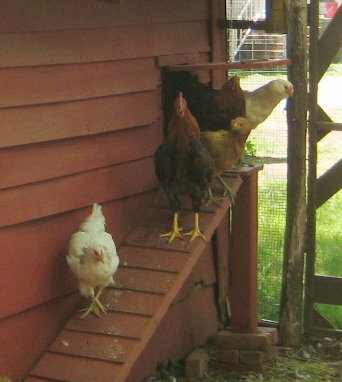 In fact sometimes they just like to hang out inside to coop. My chicken scrap treat routine is working very well. They all know to be in the yard around supper time. 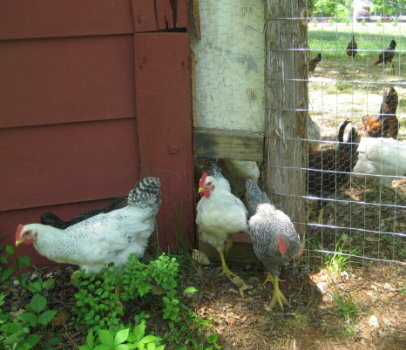 I feed them their scraps and close the chicken gate then. 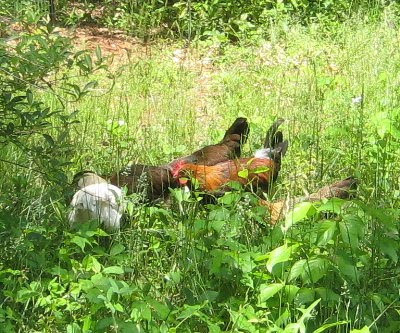 They always put themselves to bed before dark, so all is well in chickendom. I love the pictures. It is like a children's picture book tale. I much prefer when our chickens are out free ranging but..we have the most hawks,and other critters that love to eat chickens around here. 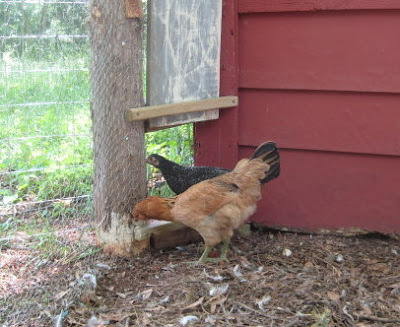 We have the chickens in the barn right now where they can go in and out. Just this morning there was 2 big hawks flying around near the barn with crows chasing the hawks. 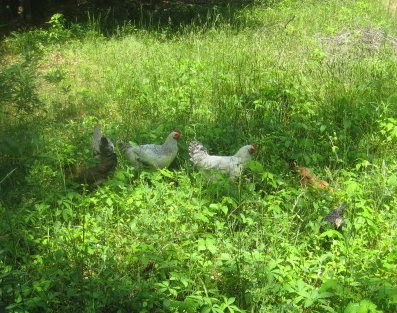 Looks like they are in chook paradise! Pam, we had quite a few hawks when we first bought the place. Then our neighbor clear cut about 25 acres or so and the hawks have all gone elsewhere. 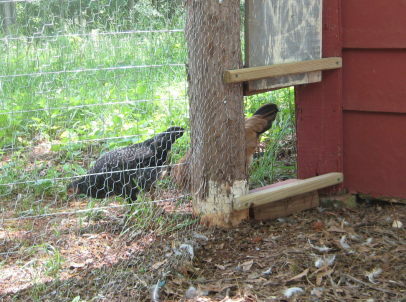 My husband really likes hawks, but know that our chickens are safer without them. Robin, I have a couple like that too. In part it seems to be the breed; my Welsummers are always at the end of the line for new things. The Delawares are usually first, along with the Barred Hollands. Of course out of 6 Delawares I think 5 are roosters, so that may have something to do with it. Why do I keep hearing Roger Daltrey's voice singing "I'm free! I'm freeee!" 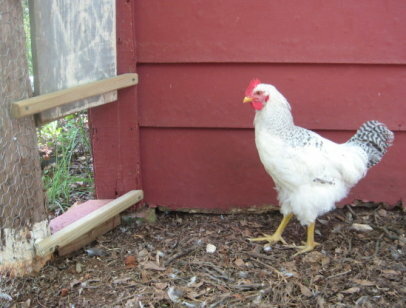 Except in chicken, it would be "Bok bok! Bok booooook!" What, doesn't everyone speak chicken? Benita, LOL. You know, I thought they'd never want to go back to the yard, but they're just as happy one place as the other. I have noticed that they are eating less feed since they've been allowed to forage for themselves. That's a good thing. Oh, they are such lovely, funny photos! :-) Don't you just love chookies? However, I can't help thinking, give them a few weeks, and they'll reduce all that greenery to bare dust! Thanks for sharing your photo-chookie-adventure with us!